Carnegie Mellon University is embarking on a multi-year, $20 million renovation project that will provide a dramatic upgrade for central teaching and learning spaces across the Pittsburgh campus. Using metrics developed by the nonprofit organization Educause, the committee rated each classroom based on design for active learning, environmental quality, furnishings and technology. Benchmarked against best practices nationwide, the committee proposed an ambitious series of renovations that will not only provide an immediate benefit to students and faculty, but position CMU to sustain world-class teaching and learning spaces over the long term. "Over the last several years, our faculty community, academic leadership, University Registrar and Faculty Senate have made it clear that improving the conditions of our classrooms, labs and studios is a top priority for them, and I share their sense of urgency," said Jahanian, who became the university's interim president on July 1. "Our mission as a university depends on an educational environment that promotes innovative teaching and effective learning." Jahanian added that some preliminary work is already underway, with the Office of the Provost, University Registrar and academic units working closely with Campus Design and Facility Development to prepare an aggressive schedule that will take advantage of every break in the academic calendar to move the project forward without disrupting classes. Lovett, a teaching professor of psychology and a co-coordinator of CMU's Simon Initiative, said the committee's proposal focused on a three-part strategy: repair, innovate and sustain. 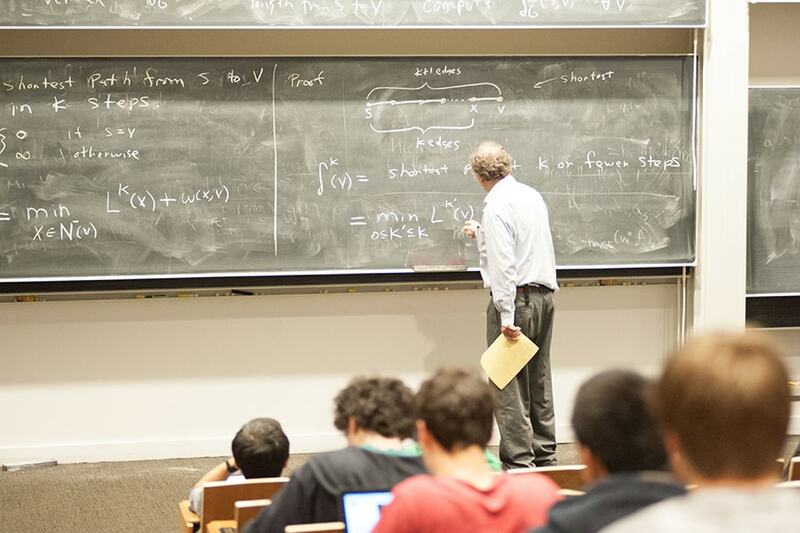 "We invest a great deal in supporting our faculty and instructors to design and teach innovative, effective courses based on the latest research, including research conducted right here at Carnegie Mellon. This classroom renovation project will increase the impact of these teaching advances and enhance the educational experience for our students," said Lovett, an expert on how students learn and how instructors can apply cognitive psychology principles to improve their teaching. The project will overhaul dozens of the most heavily used spaces in historic campus buildings such as Baker, Porter, Doherty and Wean halls, Margaret Morrison Carnegie Hall, Mellon Institute and the College of Fine Arts. This project also will include the renovation of 10 classrooms in Posner Hall that will become available to the university community beginning in 2018, when the Tepper School of Business moves into the new David A. Tepper Quadrangle. These classrooms in Posner, representing more than 700 seats, will deliver more high-quality learning spaces to benefit the entire campus. Beyond essential improvements in lighting, comfort and accessibility, the renovations will create innovative templates for the campus's learning environments. The upgrades will incorporate flexible furnishings to adapt to a wide variety of learning activities and instructional technology that will allow students to engage actively with course content, collaborate with peers and interact with instructors. On the more innovative end of the spectrum, some technology enhancements may allow instructors to gather more learning data and analytics in real time. Lovett said in order to keep CMU's teaching and learning spaces at the forefront of educational practices, the university will use its new technology-enhanced learning center, set to open in the Tepper Quadrangle next year, as a working laboratory for instructional innovations. The center will include an innovation studio and a model classroom in addition to its teaching and learning laboratory. "These ambitious plans to enhance and sustain teaching and learning spaces will allow Carnegie Mellon faculty to innovate today, benefiting our students, and to shape effective learning environments moving forward," said Jeanne VanBriesen, chair of the Faculty Senate, the representative assembly of the CMU faculty community. VanBriesen, the Duquesne Light Company Professor of Civil and Environmental Engineering and Engineering and Public Policy in the College of Engineering, said Faculty Senate has been a consistent champion for the importance of these pedagogical investments. University officials stressed this $20 million investment is part of a much longer-term strategy, which will include an increase in the annual budget allocated to classroom renovations and maintenance. "Even as we add new infrastructure to support education and research, some of our most important investments are in our historic facilities," said Rodney McClendon, vice president for Operations. "This project marks an important step in our stewardship of these buildings and our strategic planning for future generations." That stewardship is not limited to classrooms. Earlier this year, Webster oversaw a renovation of Carnegie Mellon's Sorrells Engineering & Science Library that transformed the space to support student learning in new and innovative ways. He said the work, which "delivers space to meet the needs of 21st century students," increased individual study space by 25 percent and added new technology-equipped group study and project rooms to facilitate collaborative work.